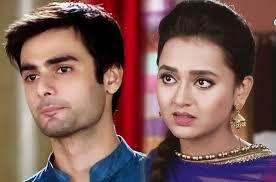 Ragini and sanskar shows thumbs up to each other…. Sanskar- hey everyone present here…..may I have you attention please…. A boy- hey bro…where is your gf…..
Girl- ohkkk ohk…we will surely help you..
Sanskar passes by her…and goes to ragini standing behind kavita…..
Everyone comes and takes ragini with them to centre of the park……..sanskar comes and holds her both hand…. Mai Kisi Se Kahunga Nai ..Mai Kisis E Kahunga Nai…. Apni Adhuri Si Kuch Khwahishein…. Someone gives sanskar umbrella sanskar puts umbrella on ragini and him…. Sanskar holds ragini’s face…..ragini blushes and turns her face…and makes a pout…looking damn cute….sanskar smiles looking at her..
At otherside…kavita burns in jealousy..
Sanskar- yeah angel….it worked out…..and kavita left me by her own for this langur…..oops dog……..oops I m not getting his name………slip of toungue…dear don’t mind..
Vicky and kavita looks at them…. Kavita fumes in anger looking at them…. Sanskar and ragini do hi-fi….and laughs loudly…. Sanskar- why did you change ragini…….you said money doesn’t matters…the why did you did the same with me…….. Both ragsan sleeps remembering each other…. Everyone in maheswari mansion and Gadodia mansion is busy in swalak’s maaraige preparation……..
Ragini swara and sonal are sitting in dining room……..swara is busy chatting with Laksh…..while sonal is busy in selecting dresses…ragini looks at them and gets bored…. Ragini- what stop glaring me……and you swara from tomorrow you will be with Laksh only whole you life…….cant you wait till tomorrow………..here I m getting bored and you both busy in your self……..
Ragini- party………bachelors party for swara…what say..
Ragini- so 12 o clock at terrace…. Laksh also enjoys with his friends his last day as a bachelor…. He goes in flashback on the day when she weared that dress…. Sanskar- ragini you here at this time…….dont you have college……..
Sanskar- did you went to temple..
Ragini gives him prashad……..and then goes in next room and brings aarti……….she does his aarti and puts tika on his forhead…. Sanskar- ragini ragini ragini……I got the job……..i am very very happy..
Sanskar- ummm gift for you from my advance salary………wear this and come to garden area…. Sanskar- no buts and ifs go..
Sanskar is waiting for ragini at gearden area…..which is beautifully decorated…with table at centre…………. Ragini comes there wearing the same red dress…….sanskar gets mesmerized seeing her…. Sanskar goes to her…….and holds her hand…..
Sanskar come to ragini and kneels down..
Sanskar become teary eyes remembering his past memories….